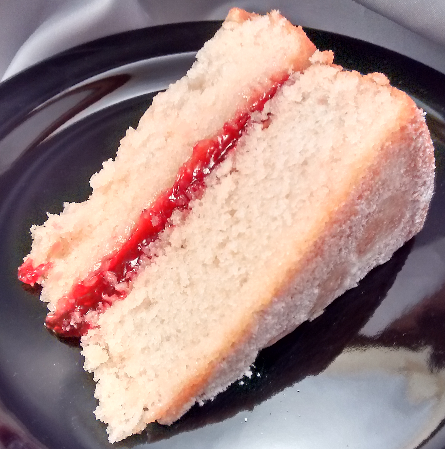 Everyone likes cake, including vegans…but the problem with many vegan cakes is that they require a chainsaw to slice. This cake—with its unexpected ingredient—changes that. It’s light and moist with a pleasant almond flavor. This is a very fragile and moist cake. You must use parchment paper while baking and cooling to keep it from falling apart. Slice it slowly and carefully. Heat your oven to 350 degrees Fahrenheit. Grease or spray two 9”x3” round baking pans, place parchment rounds in the bottom of the pans and grease or spray the parchment. Set aside. Put the garbanzo bean liquid into the bowl of a stand mixer fitted with a metal whip. Whip the liquid on medium-high to high speed until soft peaks form. Gradually add .5 cup (96 grams) of the sugar while whipping on medium-high to high speed until firm peaks form. Place in a bowl large enough for folding. Rinse and dry your mixer’s bowl. Fit your mixer with the paddle attachment. Combine the sifted cake flour and baking powder in the mixer’s bowl. Turn the mixer on at its lowest setting and allow the ingredients to mix for 3 minutes. Add the canola oil and allow it to combine with the flour on the mixer’s lowest setting. Continue until the oil has coated all the flour. In a small bowl, combine the almond milk, salt and almond extract. Stir until the salt is completely dissolved. On low speed, alternate mixing the almond milk mixture and the remaining 1.5 cups (288 grams) of sugar into the batter. When the batter has taken all the liquid and sugar, turn off the mixer and scrape the bottom and sides of the mixing bowl to make sure everything is mixed. Turn the mixer up to medium speed and allow it to beat for three minutes. Stir .25 cup of the whipped garbanzo bean liquid into the mixer bowl to lighten the batter. Fold the batter, in thirds, into the whipped garbanzo bean liquid. Be careful to deflate as little as possible. Divide the batter evenly between your pans and bake for about 30 minutes, until it is firm in the center, pulling away from the sides and a toothpick inserted in the center comes out clean. Carefully place a layer top-down on the serving plate. (You can use a spatula to make sure the cake does not break.) Carefully peel the parchment paper off the bottom. Cover the layer with the preserves. Carefully place the other layer top-down on top of the first and peel off the parchment paper. Sprinkle powdered sugar on the top and serve. Copyright © 2016 - 2017 by David Fisco. All rights reserved worldwide. Requests for licensing and distribution can be emailed to David Fisco.